HostEurope Review 2019: Is HostEurope a Good Hosting? Host Europe is a long-standing German company with a large customer base. Its feature-packed plans come with a good uptime guarantee but only one domain. Host Europe, a German company, was founded in 1997 with a vision to provide high quality hosting. The company hosts more than 1 million domains, with 250,000 customers, and 46,000 virtual servers in use. The website is available in German and English. Host Europe own two data centers in Cologne and Strasbourg powered by green energy, which have reportedly have 66% less energy consumption for the infrastructure when compared to similar data centers. The power is supplied by generators with n+1 or 2n+1 redundancy and the center has connections available with 550 Gbit/s to the most important carriers, as well as a fully redundant MPLS ring structure with a total capacity of 100 Gbit/s. The servers are solid state drives (disk read / write speeds up to ten times faster than HDD), and the company uses robust Hewlett Packard branded hardware. What’s more, Host Europe commit to 99.95% uptime and back it with a solid service level agreement. These plans are feature-packed. For experts, all plans come with FTP and SSH access, as well as support for PHP version 7.2, Ruby, Python and CGI scripts. Plans come with multiple MySQL databases, .htcaccess, as well as Server Side Includes. For beginners, all plans come with a Mini version of the website building tool, however, if you need more, you can purchase either the Basic or Premium versions of the tool as an add-on. The website building tool is comprehensive and includes some nice value adds such as 15 (Basic) or 80 (Premium) design templates, a responsive editor, and for customers of the Premium plan a PayPal and Dropbox integration, as well as HTML code. Overall, I am impressed with the packages, and my only real gripe is that whilst you can have unlimited subdomains, only one domain is allowed per account, which is limiting for most website owners. The prices are okay, in line with local and international competitors, given the level of resources and quality of the infrastructure. A SSL certificate is always included, however, domain registration is an added cost. If you purchase a plan in a one month term, there is a small setup fee. However, if you opt for a twelve month plan, the fee is waived. What’s nice is you can up or downgrade at anytime, without incurring any costs. There isn’t a money back guarantee but you can cancel at anytime, with four weeks notice. There are various ways to get support if you need it (24/7/365). There are local German, Austrian, and Swiss telephone numbers, as well as email addresses for sales, support, and contract related issues. There is a small FAQs section on the main website, however, as there is a client login zone, it could be that there are more resources only available to logged in users. One of the leading hosting providers in Germany, with hundreds of thousands of customers, and almost one thousand positive reviews by customers. If you can cope with only one domain (which in my opinion is too strict), the plans are good value for money with generous features. 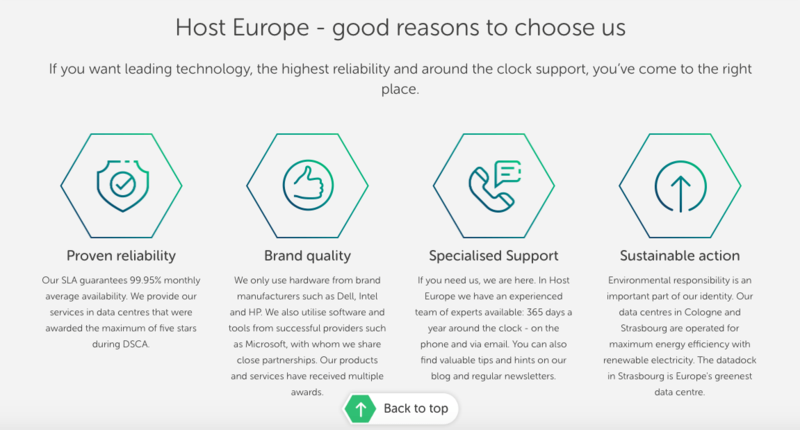 Wondering how HostEurope stacks up against other Web Hosting companies? Enter any other Web Hosting company and we will give you a side-by-side comparison.